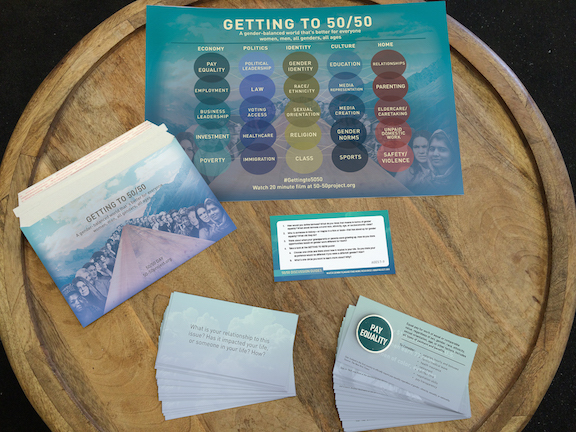 Many of you will be using the hands-on discussion guides (pictured above), which include the poster Getting To 50/50, conversation cards that can be used in a number of different ways, and discussion guides for different ages (7-9, 10-14, 15-18, and 19-99+). How would you define fairness? What do you think that means in terms of gender equality? What about fairness around race, ethnicity, age, or socioeconomic class? Who is someone in history — or maybe in a film or book — that has stood up for gender equality? What did they do? Think about when your grandparents or parents were growing up. How do you think opportunities based on gender were different for them? 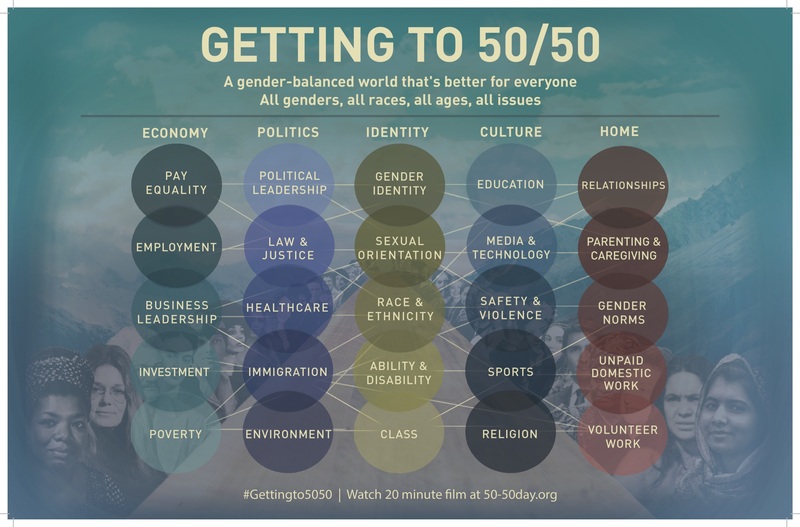 Take a look at the GETTING TO 50/50 poster. Choose one circle and think about how it relates to your life. Do you think your experience would be different if you were a different gender? How? What’s one circle you want to learn more about? Why? The film 50/50 talks a lot about mentors—people who help us become what and who we want to be. Who in your life helps you learn and grow? How do you feel when people are being treated unfairly? What can you do when that happens? How would you define equality? What about equity? What do you think that means in terms of gender? What about in terms of race, ethnicity, age, or socioeconomic class? Choose any two circles that are not next to each other. How do they relate to each other? Think about when your grandparents or parents were growing up. How do you think opportunities based on gender were different for them? What do you think the world will be like in 20 years in terms of gender equality? The film talks a lot about mentors. Do you have mentors? What qualities do you admire about them? If you don’t have mentors, what qualities would you look for? What difference would a mentor’s gender make to you? How much gender balance do you see in your home? School? What are some rules or policies that could lead to more gender balance in either place? If you could have any job in the world when you grow up, what would it be? Do you think that job is mostly held by people of a certain gender? Why? Do you think the world would be different if there were more gender balance in politics (presidents, congress members, senators, local leaders)? How did you feel when you heard that there have been more than 50 elected women presidents and prime ministers? What, if anything, was surprising to you about that number? How would you define equality? What about equity? Justice? How do they relate to gender? How do race, ethnicity, religion, or socioeconomic class factor into this? Take a look at the poster GETTING TO 50/50. What circles on the poster do you want to learn more about in terms of gender equality? Why? Choose any two circles that are not next to each other. How do the two issues relate to each other? What, if any, issues do you feel are missing from this poster? Why? The film talks a lot about mentors—people who help us become what we want to be. Do you have mentors? If so, what qualities do you admire about them? If you don’t have mentors, what qualities would you look for in a mentor? Would their gender be important? Why? How do you think the world would change if there more gender balance in politics? What about more gender balance in business leadership? Or in homes? Knowing that gender is on a spectrum, how would you define your gender? Why? Do you have qualities that are typically considered masculine? Typically considered feminine? Why are they considered that way? How would you define equality? What about equity? Justice? How would you define gender equality/equity/justice? How do race, ethnicity, religion, socioeconomic class, geography relate to gender equality? We’ve thought of the story of women in power as a story of scarcity. How can we shift that to telling a story of abundance? How might that shift change things? The film talks a lot about mentors. Who are your mentors? Is their gender important? Why? How’s the gender balance in your own home? What about your workplace? What are some rules or policies that could lead to more gender balance in either place? How has the world changed in terms of gender equality in your lifetime? What about since your parents’ or grandparents’ generation? Where do you think we’ll be 20 years from now? Fifty percent of men with paid parental leave feel they can’t take it. Why do you think that is? What would change if more men took parental/family leave?